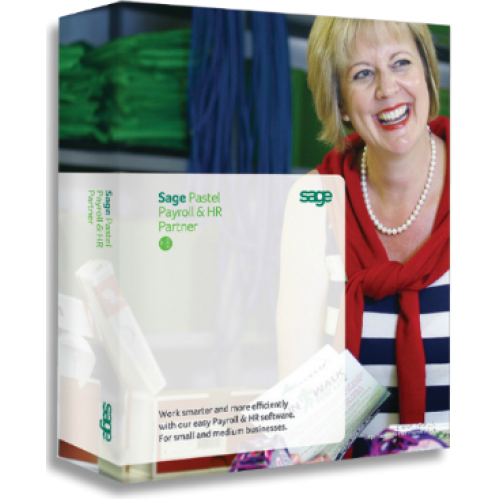 Sage Pastel Payroll provides you with access to an easy to use, accurate and secure payroll solution with all the features you require. It integrates seamlessly with the Pastel Partner Accounting software suite and most other accounting software packages available on the market. It ensures that your business is kept up-to-date and complies with the latest legislative requirements. This payroll product is available as a stand-alone, single-user version for the smaller company, or is scalable up to 10-users for a larger company and can accommodate an unlimited number of employees in varying employee brackets and can grow with your company. It caters for the full spectrum of requirements, from pre-defined, standard sets of transactions for less complicated payrolls, to more powerful and customisable features and functions for payrolls with more sophisticated requirements. A new output option has been added to the printing options of all reports in Pastel Payroll, including the printing of payslips. You can now print reports and payslips in a Protected Document Format (PDF). This ensures that you have a secure method of report distribution as these documents cannot be amended by the recipient. You now have the option to e-mail payslips directly to your employees upon or after processing your Payroll Run. This feature will allow you to e-mail each employee’s individual payslip to him/her directly, provided that a valid e-mail address and password was entered for the employee under Edit…Employee Masterfile. An optional module is also available for the bulk e-mailing of payslips to a responsible person at a cost centre, pay point or user level. The previous ‘e-mailing of reports’ functionality has been enhanced to include two new format options when selecting to e-mail reports, by the way of Protected Document Format (PDF) and an Encrypted Format. A “Reports To” field has been added to the Personal tab of the Edit…Employee Masterfile, allowing you to specify the Line Manager for that employee. In addition, a “Non-Payroll Managers” option is available under the Edit menu, allowing you to create a list of Managers that are not available on your specific payroll database. This would be useful where the executive payroll database is kept separate from the standard payroll. All Managers created under this menu option will be available for selection when completing the “Reports To” field. This module dynamically links to your payroll data, taking your business way beyond traditional reporting functionality, using the power of Microsoft® Excel. This module ships with 20 standard report formats, such as a job costing report, year-on-year leave comparison report, leave report, to name a few! These reports can be ‘sliced and diced’ according to your own unique requirements, including comprehensive graphical charts for easy analysis and reporting purposes. You no longer have to manually complete the Industrial Council reports and can simply generate the submission file (where applicable) and e-mail it to your Industrial Council at the click of a button. We now cater for MIBFA, MIBCO/MICFA, the Road Freight Industry and the Electrical Industry. This module allows you to e-mail batches of payslips to a specific employee, manager of a cost centre or pay point, a specific contact in your Microsoft® Outlook address book or any Payroll user. Payslips can then be printed at remote destinations onto our professional pre-printed and confidential stationery and quickly distributed by the responsible person to each employee, saving you money on postage, with peace of mind that the payslips will never fall into the wrong hands.